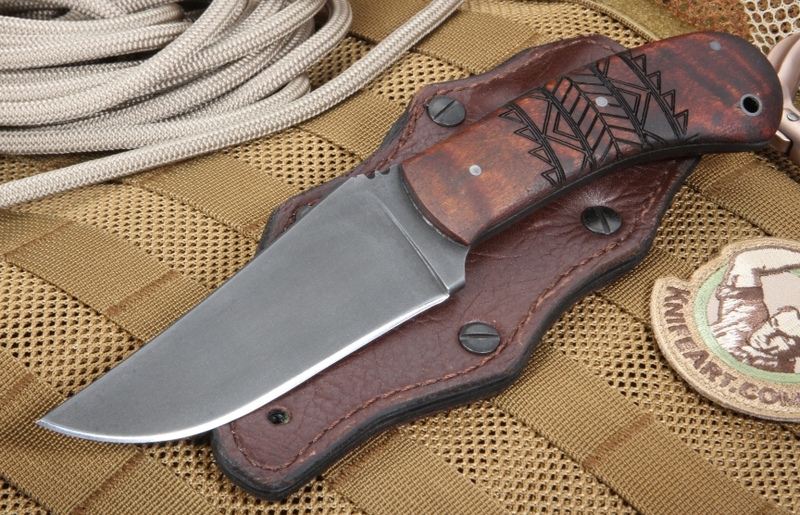 Part of David Winkler's WKII line, the Winkler Belt Knife with the Tribal Maple handle and Caswell finish is inspired by Winkler's work with the United States Special Forces teams and Allied SOF team. Winkler has done extensive work with these units and has built their recommendations and needs into this American-made fixed blade knife. Weighing just less than 6 ounces and measuring a total length of 9 inches, the Winkler Belt Knife is lightweight for high-performance work. 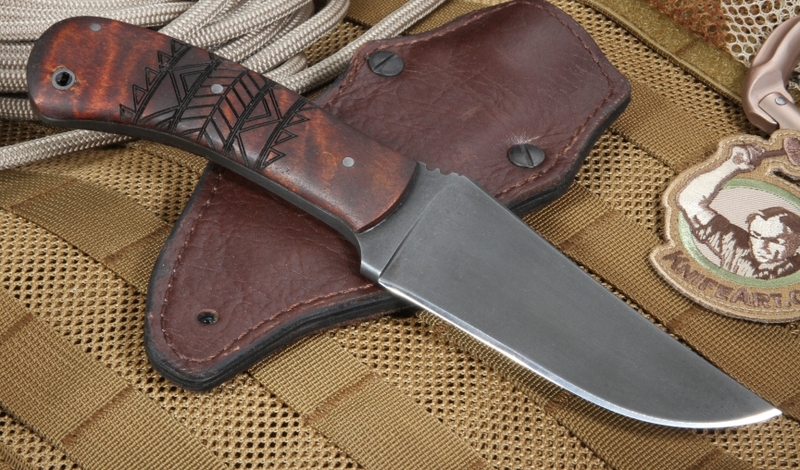 Winkler made his first knife in 1975, and his latest belt knife is an authentic and affordable tool for military personnel and outdoorsmen. The Winkler Belt Knife is a fixed blade compact knife measuring 4.75 inches long. 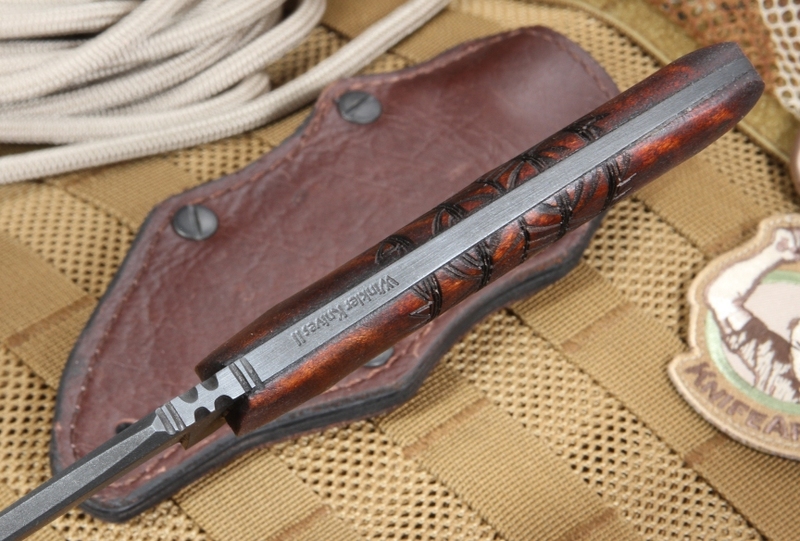 It is made of 80CRV2 high carbon steel in a clip point blade style. The razor sharp edge can quickly slice through all types of materials while carrying the ability to pierce and deeply cut through hard and soft substances accurately and on course. Carbon steel knives are known for having some of the best value for toughness and reliability. The blade also has a Caswell no-glare finish, which removes any sort of glare or reflection from the blade. This makes it a great tactical tool in bright and dark environments. The handle of this large belt knife is made from premium curly maple complete with tribal marking designs to give the knife the look of its warrior personality. Made with full tang construction, the handle has a comfortable grip and filed thumb rest on the blade spine for secure holding in even the slickest environments. It includes a lanyard hole for carrying which also provides easier access. In addition, the knife comes with an ambidextrous Kydex-lined brown leather sheath. This custom knife protector can be adjusted to wear your Winkler as either a vertical or horizontal belt knife depending on user preference. Buying the Winkler Belt Knife with a Maple Tribal Handle through KnifeArt ensures a 100 percent satisfaction guarantee with a new authentic Winkler knife. We offer same-day shipping with fast delivery anywhere in the world, and with this knife, you get free ground shipping in the U.S. (Next-day and two-day options are also available.) Place your order today to receive a one-of-a-kind Winkler Belt Knife. I own several quality knives , but the Winkler is one of the most beautiful , quality knives I have ever held in my hand.. I has a solid feel and is very sharp. I always worry about a knife slipping in my hand having cut myself badly in my early years. Thiis Winkler belt knife has solid grip with a thumb rest to give a very solid grip for cutting or skinning. I like the horizontal carry feature with the fine leather sheath. I highly recommend Knife Art; my Winkler was shipped within an hour of my purchase and arrived in 3 days. The knife was all I expected and more. Doing business with Knife Art was easy as well. A first class site offering first class products. This knife is simply phenomenal. The fit and finish is top notch and it feels great in the hand. The sheath is also tops. It has a great belt clip as well as other options for securement which are fantastic. I can't say enough good things about this knife. My only problem with the Winkler line of edged tools is which one to get next :). Seriously, anyone who appreciates quality owes it to themselves to own at least one Winkler product. You can understand why special forces operators use wrinkler knives, once you have one in your hand, well made, hard use and superb feel in the hand , razor sharp, light with a well made sheath . This is a fine blade. I will be another one for sure.